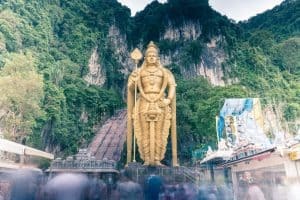 Batu Caves is one of the top sights in Kuala Lumpur and just like the Petronas Twin Towers (aka KLCC) and a meal in Chinatown the caves shouldn’t be missed on your visit to Malaysia‘s capital. 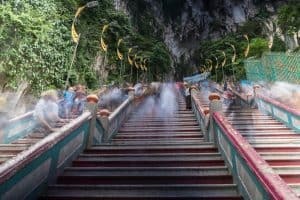 When you google Batu Caves, you’ll usually only see one image: A massive flight of stairs next to giant golden Hindu God leading up to what is known as Temple Cave. However, Temple Cave is just one of five Batu Caves. The name “Batu” derives from rock – fitting for a massive 2 km wide and 329 m high limestone hill that rises just North of Kuala Lumpur. In the 19th century, Chinese immigrants discovered the caves for the guano that the caves’ bat population produces. They harvested the guano as fertilizer for their fields. 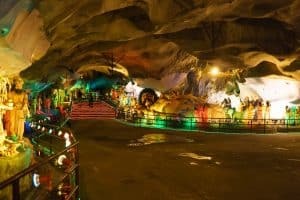 In 1890, an Indian trader noted the shape of the entrance of the main cave and decided to build a shrine dedicated to Lord Murugan, the Hindu god of war, inside the cave. 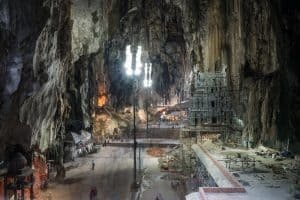 Guano and limestone harvesting continued in the various Batu caves for a few more decades before the administration of most of the caves was handed over to Kuala Lumpur’s Sri Mariamman Temple. 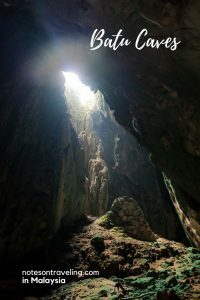 Since 2011, Dark Cave is managed by Cave Management Group, which explores the unique flora and fauna of the cave while making it – partially – accessible to the public. 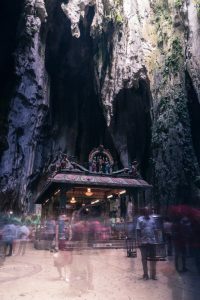 So here’s a run-down of what to expect when visiting the individual Batu Caves (including entry fees and estimated time to visit). 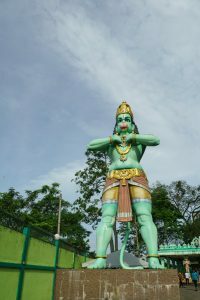 When you arrive by train (see below for directions), the first thing you’ll see on your left as you enter the temple grounds is a large green monkey-faced sculpture to your left: This is the Hindu God Hanuman, a devotee of Lord Rama to whom the first Batu Cave is dedicated. After you’ve paid your 5 Ringgit entrance fee, you’ll pass an impressive horse and carriage made from brass on your way to the cave entrance. Inside, the story of Lord Rama (and Hanuman) is told with colorful sculptures (I hesitate to use the word diorama as it’s much more). All the explanations are in Sanskrit (I’m guessing) so you won’t fully understand what is going on. All the way at the back of the cave, Hanuman’s monkey tail is burning – the event is recreated with LED fairy lights. 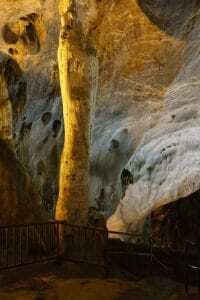 Beside the story of Rama, the cave boasts two “natural linga” – phalluses that are very commonly displayed in Hinduism. To see the linga you have to climb very steep steps in the cave chamber. Truth be told, if you aren’t a faithful Hindu, you’ll probably find those linga anticlimactic [sic!]. They are stalagmites, and not even pretty ones. But the view from up there in the massive cave chamber plus the fun sculptures make the 5 Ringgit, IMO, totally worthwhile. Time to visit: 30 minutes (or less). 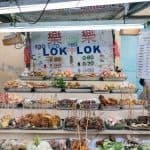 On your way to the next part of Batu Caves, you’ll probably see macaque monkeys – there are many of them around the place and you need to hold on to any food you might have as they are very cunning. As you continue to make your way to the main event, you’ll see the Sri Venkatachalapathi & Alamelu Temple, where Brahmins (Hindu priests) give blessings to devotees. This is not a cave, just interesting to watch the proceedings. One of the two entrances/exits to Cave Villa is right next to the shrines. The entrance fee is 15 Ringgit. Once you’ve entered, you’ll see enclosures/caves with loads of birds, bunnies, and iguanas as well as a pool with giant fish. Animals play a big part in these two caves and they are the reason why I can’t fully recommend you visit. 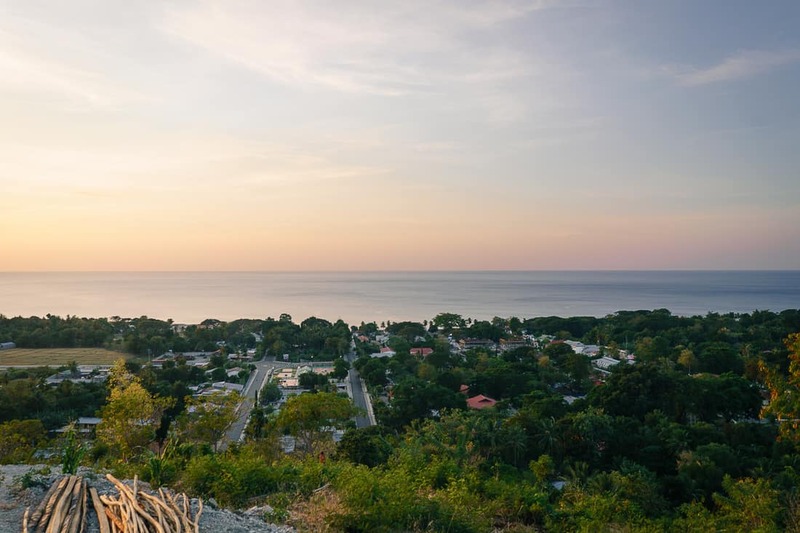 But let’s start with the reasons why you should visit Cave Villa: this is a cultural center where you can learn a lot about Hindu religion. 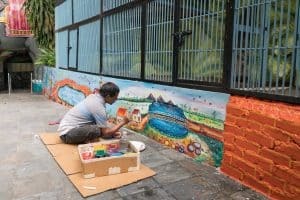 The first cave is painted all along the walls in pastel colors. The murals, sculptures, and information tables (in English) give extensive background info on Hinduism as practiced by the Tamil Nadu. You learn about the main Gods and the epic stories shared from generation to generation that tie all the Gods together, and even find info on famous Hindus from Siddharta (the first Buddha) to Gandhi. You’ll also learn about festivals and traditions practiced. It’s a feast for the eyes as it is informative. Passing the stage with hourly dance performances as well as more fish ponds you’ll get to the second Cave Villa cave. It starts off with more colorful infotainment but the last third of the cave is a reptile exhibition. And the animals don’t look happy in their tiny, darkish terrariums, occasionally being pulled out so visitors can take photos with a python, a parrot or an iguana. Beyond the second cave, the Cave Villa complex has a large koi pond with an artificial waterfall and bridges leading to the other entrance/exit. To sum it up, I recommend visiting Cave Villa if you are interested in Hinduism. Know, however, that part of your money supports animal cruelty: so whatever you decide to do I definitely recommend not to pay to have your photo taken with the reptiles or birds. Time to visit: up to 1 hour (more if you read all the information tables). Leaving Cave Villa behind and looking to your left the main attraction comes into view: the golden Lord Murugan statue and massive, 272-steps staircase to the Temple Cave (and Dark Cave). When you come by car, this will probably be the first thing you see as the main gate, the parking and stalls selling sweets and souvenirs are all in front of Lord Murugan. 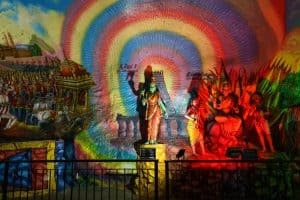 At this point, the place appears more like a Hinduism theme park than a religious site. If you want to get a bite to eat, I recommend not to go to the places right in front of the golden statue but to go toward the toilets and eat at the restaurants just opposite the toilet complex. They offer excellent Indian fare at fair prices as you can tell by the local visitors also dining there. Iconic as it has already become, the Lord Murugan statue – at 140-feet (almost 43 m) the tallest of its kind – was only unveiled in 2006. If you are female and want to go up the stairs to Temple Cave, you will need to cover your shoulders, bust, and knees. You can rent a scarf/sarong right by the staircase if you’ve come unprepared (5 Ringgit) or you can buy trousers or a sarong at one of the stalls by the restaurants. Checking is rigorous. The stairs are comfortable to scale – wide and of regular height with railing to hold on to and terraces to take breaks and take in the view of Kuala Lumpur’s skyline in the far distance. So climbing up was easier than expected. There are always a lot of monkeys on the stairs, so make sure you stow any biscuits etc. in your backpack – I’ve seen the monkeys tear plastic bags with plastic-wrapped sweets from bypassers’ hands – these guys are smart and fast! The Temple Cave consists of an entrance area with a shrine, one very lofty chamber, where a temple is currently in construction and a second “atrium chamber” (i.e. the roof has collapsed and you can see the sky far up) with the original temple from 1890. The history of Batu Caves as a religious site dates only about 100 years back, so you won’t find any ancient relics here. 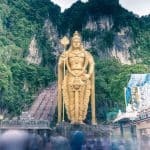 Since 1892, the annual Thaipusam Festival is held in Batu Caves and sees thousands (some say a million) of devotees show their adoration of Lord Murugan. 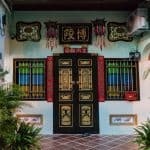 If you come to Kuala Lumpur at end of January/in early February, the colorful processions and the sometimes gruesome-looking celebrations of the Warrior God of courage, wealth and wisdom are a sight to behold. Time to visit Temple Cave (outside Thaipusam): up to 1 hour (including leisurely climbing the stairs). Note for photographers: The stairs face in a Southwesterly direction. So the light outside is good throughout the day. To me, Dark Cave is the highlight of Batu Caves. Dark Cave, to the left of the staircase and just a few steps below Temple Cave, is a natural monument not affiliated with the temples but managed separately. To visit the cave you need to book a guided tour (35 Ringgit for adults). 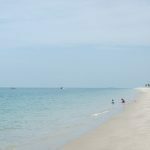 It is best to buy your tickets before you head up the remaining steps to Temple Cave as you might have to wait for an hour for an open slot. Tours leave every 15 to 20 minutes but at max. 15 people per group they fill up quickly. There is a small sitting area outside Dark Cave with info material to pass the time but food or drinks are not available up here. Note, that the Temple Cave dress code for women to keep shoulders, knees, and bust covered applies, even if you only want to visit Dark Cave. Also, beware of the monkeys when you sit there and have a snack – they will come and try to steal your food if you aren’t careful. Go to the entrance about 5 minutes before the time listed on your ticket. Your guide will hand you a helmet (children’s sizes are available) and a torch. While the path into the cave is made of concrete it can get slippery and wet; so you’d be better off wearing some sort of sneaker or hiking shoe (rather than just flip-flops). Also, there is a lovely breeze inside the cave; easily-chilled travelers might want to bring a sweater/long pants. 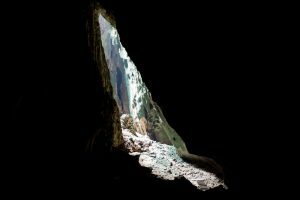 Dark Cave is home to one of the rarest spiders in the world – the trapdoor spider – as well as to bats, a snake, and various insects that are endemic to Batu Caves. Your guide will be one of the scientists exploring and studying the cave; they may be a biologist, a geologist, an entomologist, etc. 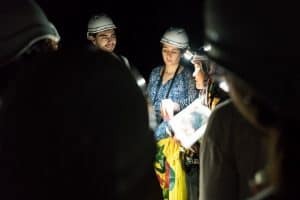 On your tour along an 850m path that ends in a chamber with a broken roof so that light falls into the cave, you’ll stop several times to marvel at the absolute darkness of the cave, to spot the various animals, and to hear more about the history of the cave. Guides generally speak very good English and love to answer questions – so ask away! Time to visit: Tour takes 45 to 60 minutes, wait time can be an hour or more (online booking of tickets is not possible). You can simply take the metro train to Batu Caves station (the end of the line). The journey costs about 3.50 Ringgit (depending on where you get onboard), takes less than 45 minutes and since trains pass through KL Sentral you can even go to Batu Caves on a layover from Kuala Lumpur International Airport. During the day and seven days a week, trains leave every half hour or hour. Or you call a Grab/Uber/taxi. I prefer to use Grab in Southeast Asia and the journey from my hostel in Little India, the BackHome, was quoted with 16 Ringgit (under $5). Considering that Batu Caves is about 15km drive from downtown Kuala Lumpur that’s a very good rate. 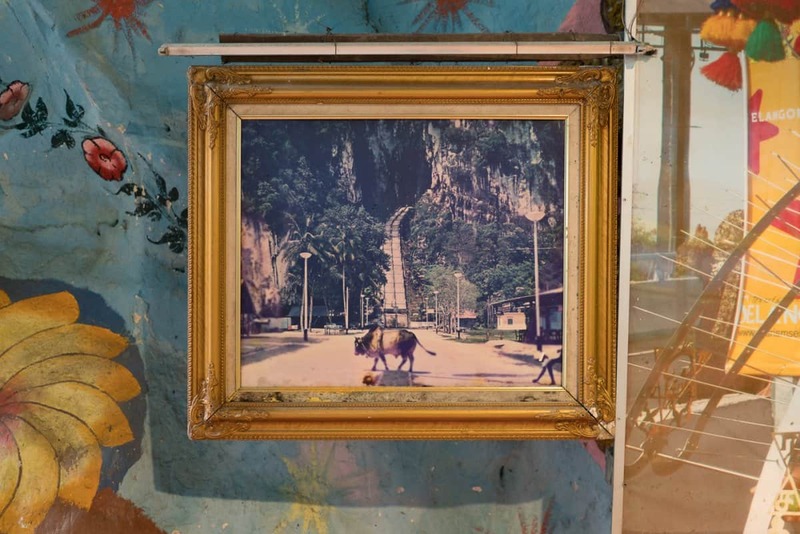 If you are pressed for time, you can book a tour that includes Batu Caves plus other sights. 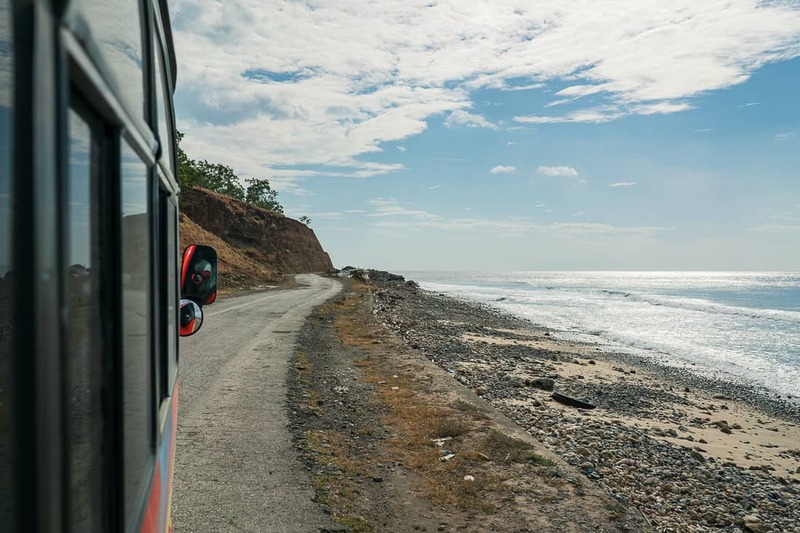 Personally, I find that Get Your Guide offers reasonably-priced options that don’t differ much from what you could book on the ground but with the added benefit of reading reviews and booking your spot ahead of time. 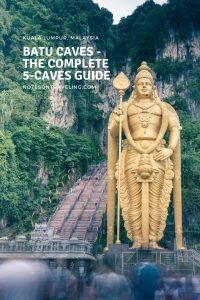 Here are their Batu Caves tours (make sure you read the reviews to know what to expect). Bring clothes that cover shoulders, knees, and bust; bring comfortable walking shoes with some grip for the Dark Cave tour. Buy food and drinks before climbing the staircase; store food safely in your backpack to protect it from cheeky monkeys. Buy your Dark Cave tour tickets before visiting Temple Cave to avoid long wait times. Plan about 4 hours to visit all five Batu Caves. *If you have any additional questions that this post doesn’t answer, sound off in a comment! The description of each of these caves got me really interested. The Ramayana Cave seems particularly interesting to me. Being an Indian, the epic of Ramayana lies very close to heart. And looks like the way it has been depicted right inside a cave, that also in Malaysia, will be really interesting to visit. Thanks for the wonderful guide, will refer back once I plan a trip here. 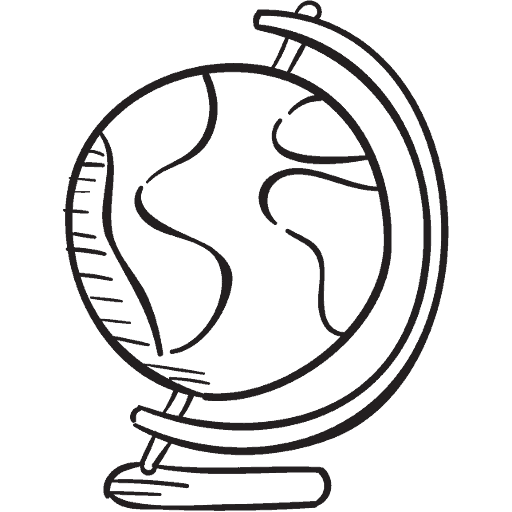 A very helpful, detailed guide – thank you! I’ve seen photos of Temple Cave before and always wanted to visit, but did not realize there were actually 5 caves to visit! The dark cave sounds cool but when you mentioned spiders that made it a no-go for me haha. I appreciate your tips about appropriate attire, where to buy food and to watch out for the monkeys! You’ve put together a very handy guide! And just in the nick of time…I’m planning a trip to Malaysia later this year! But, I must admit, I was really surprised to learn that there are actually 5 caves! I have only heard of the Temple Cave, but am totally going to check them all out! Thanks for sharing! Enjoy your time in Malaysia! The “Natural Linga” made me laugh. First I thought it’s a man made until I got to part where you said it’s a stalagmite; and not even a pretty one. Haha… But your description is so detailed that after reading this, I can tell which one that I want to do whenever I head that direction. By the way, I like your opening. 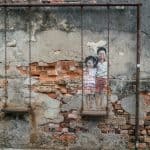 Top sights in KL besides Petronas and a meal in Chinatown. I love caves and these ones look amazing! So many of them though, don’t recommend small kids to come in so we have missed punch that we have seen on our travels. That Temple Cave is just wow! These ones are 100% child-friendly. Though, I would recommend Dark Cave for 6 and up as some sections are a bit slippery and there is one part where all lights are switched off, which might be a bit scary for younger children. I never knew that there were multiple caves! Also, this is the first time I’m seeing photos of the inside of the caves. Very cool! Good tip about where to get a nice Indian meal by the bathrooms. I’m not sure I like the fact that there’s animal cruelty, but it’s nice that the tour guides like to answer your questions and are experts so you can learn from them! Lovely write up! I visited the Batu Caves a couple of years ago, but just realised I didn’t cover the whole place. We just visited the Temple cave, wish we had made the effort to explore the place around. The Ramayana Cave looks incredible! 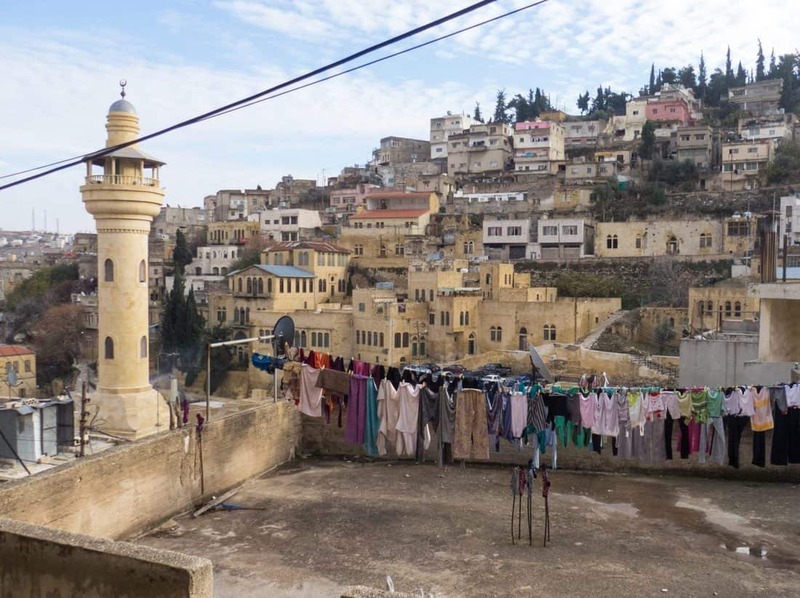 But to be honest: That’s why I wrote the post and made sure I mentioned the number of caves – most people I’ve met only knew about the Temple Cave (and maybe the Dark Cave as it’s right there almost at the top of the stairs).